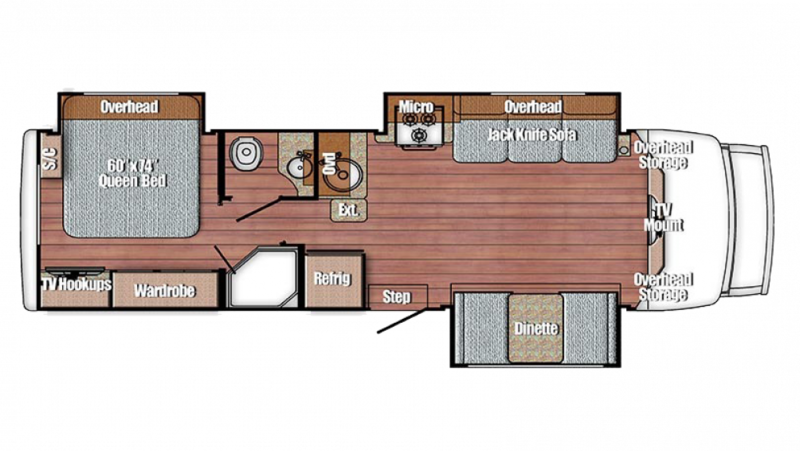 Love every camping trip with the 2020 Gulf Stream BT Cruiser 5291! Your family will love every moment inside this Gas Class C Motorhome! Here at Gillettes Interstate RV, we've had a great team of RV experts for over 44 years! There's a reason why we're known as one of the best RV dealerships in all of Michigan! Stop by 7210 E Saginaw St East Lansing Michigan 48823 to find our huge inventory of Gas Class C Motorhome RVs! For more information on this model, call us at 517-339-8271. You'll never want your vacations to end! This RV is a roomy 30' 7" long and 8' 0" wide, with 3 slides that maximize the living space! Plenty of headroom, too, at 10' 6" tall! When you need to relax inside, you can stretch out and stay cool on hot summer days thanks to the 13500 BTU a/c unit. And on cold nights or days, the 35000 BTU furnace will keep the inside cozy and warm! Your family will sleep secure and comfy in the Gulf Stream BT Cruiser 5291! It sleeps up to 5 people, and the roomy Queen bed in the master bedroom is a treat! Sizzle up some savory snacks while you're on the road! The kitchen is full of modern cooking appliances, including the 3 burner range cooktop! You can keep all your produce, meats, and drinks fresh and cold with the 6.00 cu. ft. refrigerator! Fill up the 35 gallon freshwater tank for clean water throughout your vacation!